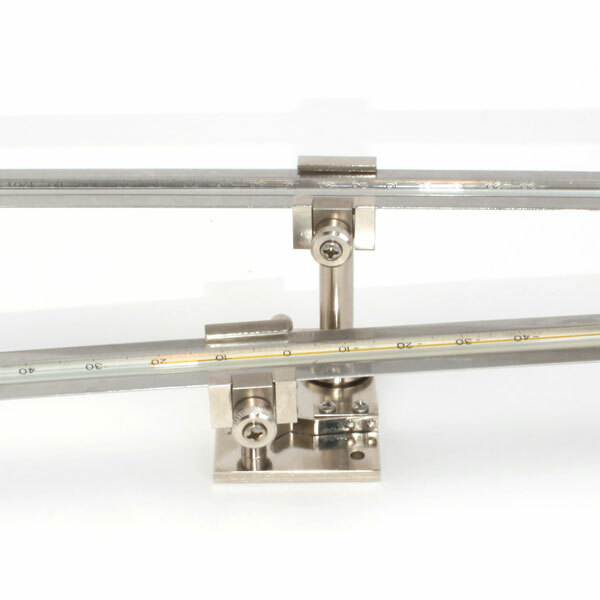 The 210-4420 Series Min-Max Thermometer Sets, made to US National Weather Service specifications, consist of a Townsend support (a weatherproof metal stand and base with two adjustable thermometer holders attached to rotatable metal posts), a maximum indicating thermometer and a minimum indicating thermometer, each secured to a stainless steel metal plate. The 210-4420 Min-Max Thermometer Set, made to U.S. National Weather Service specifications, consists of a Townsend support (a weatherproof metal stand and base with two adjustable thermometer holders attached to rotatable metal posts), a maximum indicating thermometer and a minimum indicating thermometer, each secured to a stainless steel metal plate. 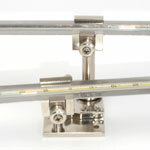 The mercury-filled maximum thermometer is 10-1/2 inches long with graduations and numerals etched in the glass. It has a constricted capillary just above the bulb which prevents the mercury from flowing back with lowering temperatures. It remains fixed at the warmest temperature to which it has been exposed. The alcohol-filled minimum thermometer is also an etched stem type, 10-1/2 inches long, similar to the maximum thermometer. It has a long, thin, dark colored float, held in tension in the capillary, which moves down towards the bulb with lowering temperatures. When the air temperature warms, the alcohol rises past the float, which remains fixed at the minimum temperature. Information about products containing mercury.